The tiles need to be looked at more closely. 13 come in English-French pairs, another 35 are in the edition’s language (either French or English), and the remaining 14 tiles come in non-lingual pairs (two each of Khosatral Khel, Skuthus, Thak, Zaporavo, and Zogar Sag, plus four Thog). The campaign book and adventure booklets use two tiles for Constantius, Khosatral Khel, Thog, Zaporavo, and Zogar Sag. 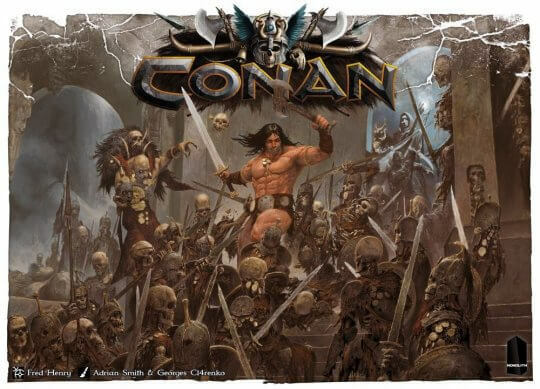 Conan: Nordheim includes a scenario that uses three Atali tiles. The non-lingual pairs (or the Thog quadruplet) are thus probably intended to be all used. This means a functional set of tiles is 62 strong, the remaining 13 tiles being set aside.